This sandwich was definitely the driest and saltiest sandwich I’ve ever eaten. I have likely eaten a sandwich that was drier, probably based around matzoh, Finn Crisp, or some other thoroughly dehydrated flatbread; and I have also likely eaten a sandwich that was saltier, probably involving herring or some other fish. 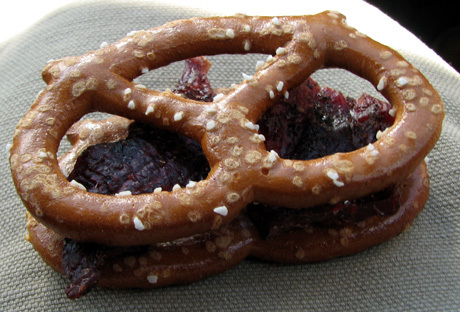 I’m pretty sure, though, that the combination of dryness and saltiness you get when you combine pretzels and jerky is one for the record books. It’s also, interestingly enough, a very tasty and satisfying sandwich, even for such a tiny package. Just as long as you have a beverage to wash it down with. This pretzel-and-jerky monstrosity was created and consumed somewhere in the middle of nowhere in a Utah desert, hundreds of miles from civilization. If kept in a dry place, it would have stayed edible for months, making it the perfect ration food. However, the quartermaster, navigator, and skipper of our crew were going 80 miles an hour down the interstate at the time of the sandwich’s production, and were not overly concerned with saving food. Quite the opposite, in fact; the jumbo-size jug of pretzels was far larger than the journey required.